GUJCET Admit Card 2019: Gujarat Secondary and Higher Secondary Education Board (GSEB) is going to release GUJCET 2019 admit card soon. More than 2 lakh applications have been filed for GUJCET 2019. Now all the applicants are waiting for the release of admit card as exam is scheduled to be conducted on 26th April 2019. We would tell all the candidates Board will issue the admit card in a couple of days. Once the admit card will be issued to the registered candidates they can download it online by using login credentials. Admit card will provide information about the exam date, schedule, test center, instructions, etc. 1.4 How to Download the GUJCET Admit Card 2019? In this article, we have shared information related to GUJCET Admit Card 2019. Candidates waiting for their hall ticket can go through the given article to collect all the necessary information. 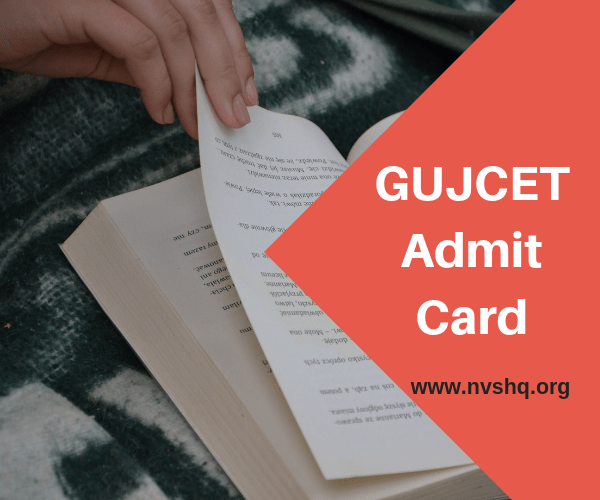 Quick Update 12th April 2019: GUJCET Admit Card 2019 will be available in few days. Candidates are advised to keep checking this page for all updates. GUJCET 2019 exam is scheduled to be conducted on 26th April 2019. Earlier it was scheduled to be conducted on 23rd April but the date has been revised now due to loksabha elections. It will be an offline exam. How to Download the GUJCET Admit Card 2019? As GUJCET admit card will be issued online, candidates have to download it from the official website. To help the candidates we have shared complete procedure to download and print the admit card online here. Step 1- Go to official website of GSEB (http://www.gseb.org) or the link shared below. Step 2- Click on the relevant admit card link shared on the homepage. Step 3- admit card search page will be displayed. Step 4- Enter all the required login credentials. Step 5- Click on the submit button. Step 6- Admit card will display on screen. Step 7- Read the particulars and instruction mentioned. Step 8- Click on print button and take multiple print of it. Keep it safe till the admission procedure gets complete. Details mentioned on admit card will be same as the details furnished in the application form. However, candidates are required to verify all the details carefully before appearing for the exam. If they find any discrepancy in admit card particulars, they should immediately contact the concerned board. Candidates can get information about the allotted exam center from the admit card issued to them. The decision of allocation of exam venue by the Board will be final and no request for change will not be entertained under any of the circumstances. Only registered candidates can avail their GUJCET 2019 Admit Card. Board will not send printed copy of the admit card to the postal address of any candidate. Candidates are required to carry valid hall ticket to the exam hall on exam day. No candidate will be allowed to enter the exam hall without a valid admit card. Candidates should read and follow all the instruction during exam given on the admit card and also by the invigilator. Examinees should reach the exam center before the time mentioned on GUJCET hall ticket. They should not carry any restricted item to the exam hall. They are advised to regularly visit the official portal for all the latest updates related to the hall ticket. Admit card should be retained till the completion of counseling and admission process.